Wow, that’s a big introduction! But trust me, this truly is the most important thing I have ever written. I’m going to tell you, yes specifically the person who is reading these very words, how you can make an actual dream come true. Now don’t worry- I’m going to get to exactly how you can do it, but first let me provide you with some background. I can’t remember the exact first story I ever wrote. But there is a first memory of when I felt the joy of entertaining others with my writing. I was in third grade and I was an interesting kid to say the least. I always listened and respected my teachers to the utmost but at the same time would always try to make my classmates laugh. So we were in the “English” part of the day and my teacher announces that we are going to write short stories. I was excited right from the start because I was super into reading at that age and this was my first real chance to create a story of my own. I hadn’t ever really had an opportunity to do that before, as I was only like nine years old. So we got to working on the story during that class time each day, but I liked it so much that I would work on my story when I got home as well. And that means I really must have loved it because this was in the Spring and even though I had a huge yard to play in, here I was sitting at a desk in my room. 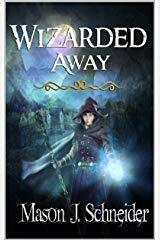 Some of you may know that I have a book published titled Wizarded Away. Well, funny enough, this story I was writing was about a group of three friends who meet a wizard! Anyway, I ended up writing this about fifteen page story in a couple days, and I was so excited about it that in class the next few days I started writing another one while everyone was still on their first. So once the week has ended and everyone has their stories written, my teacher tells us she is going to read each book out loud to the class and then we would do a “secret vote” of which ones were the best. There was something about putting the word “secret” in front of things that made them so much more fun as a little kid! I remember being nervous when it came to be the time for my story to be read. I only gave my teacher the first one I wrote, because I decided it was the better of the two. I wasn’t scared that everyone would hear it, I was just really hoping they would think it was funny. I packed that story full of stuff that kids my age would think is funny to read. all of my friends were cracking up, they loved it! It felt so good in that moment to get recognition for what I had made. And I think that’s why I really remember it even to this day, because the feeling was so strong. So flash forward through the years and I continue to stay really interested in reading and writing, I’m taking all the advanced English classes I can in middle school and high school, and I continue to enjoy entertaining my peers. Now hear I am at nineteen years old, and I’ve figured out an ultimate dream for my life. If you haven’t guessed already- it’s to become a great author who’s writing is read all throughout the world. To become someone who truly makes an impact with words I write down on paper or type on my keyboard. That impact could be entertaining, but there are many other impacts I wish to someday have on the world through my writing. Things like Inspiration – Motivation – Love and several more. Tell other people about me, my writing, my passion, my goals. You can do this in person, social media- there are virtually endless different methods of communication. Leave my books Amazon reviews, I don’t even care if you hate it and give it one star, because your feedback directly helps me become a better writer. And it can really help me get some status in the endlessly huge world of authors. Why wouldn’t you want to help someone fulfill their dreams? I personally cannot think of many scenarios where I wouldn’t help someone reach their goals if I could, especially when it’s so simple. And it feels good to help other people succeed. I hope now you have a slightly better understanding of just how much your support can mean to someone. And this message applies to millions of other people out there chasing their dreams- artists, singers, movie directors, etc. The people who create content in this world, the people who make those movies and books that we truly can feel when we watch and read- I am one of those people and I know I speak for my peers when I say we all need support. If you want to help me– the link to my books will be below. You can get them both on e-reader and in paperback, so even if you just have a smartphone you can have them downloaded to that. They aren’t expensive, nothing more than a Starbuck’s drink. And if you choose to purchase the paperback of either of my books (both $9.99 in this form) just to show you how much I appreciate your support- Get in touch with me, send me the book, and I will write a personal message and sign it and send it back to you. Don’t have the money, but still want to help? Just follow me on Twitter and retweet my book posts. You’d be surprised how much of an impact it can make. I truly, truly, appreciate your support- you are literally making my dream come true. Thank you, from the very essence of everything that makes me a writer and a fellow human being. Previous Post Can you feel love?